Over 100 of the 574 segmented mirror blanks needed for TMT’s 30-meter-wide primary mirror have already been produced in Japan, with fifty of those transported to a Canon factory in Utsunomiya (about 70 miles outside Tokyo) for surface polishing. Canon Inc. and the National Astronomical Observatory of Japan have established a polishing process for the individual mirrors. Coordinated research and development is underway with China, India and the United States to conduct additional polishing work. The mirror production process begins with unpolished glass segments produced at a factory near Tokyo. TMT has chosen a special glass ceramic material called CLEARCERAM®-Z, developed and produced by OHARA Inc. in Japan, to meet the telescope’s stringent specifications. These mirrors are made of high quality material with zero thermal expansion properties to prevent it from deforming. The current Keck telescopes on Maunakea use a similar mirror design, but each telescope only requires 36 similar mirror segments in comparison. When in operation, the primary mirror of the Thirty Meter Telescope is expected to have 156 times the light-gathering power and 13 times the resolving power of the Hubble Space Telescope. 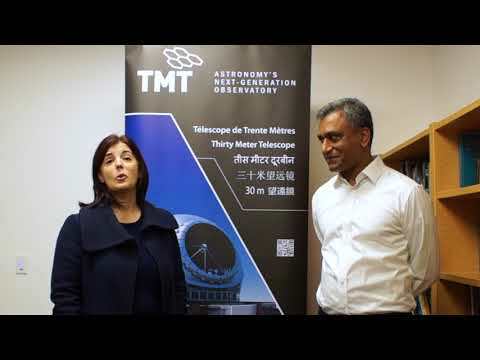 TMT is expected to deliver sharper and deeper images than existing telescopes both on the ground and in space. This will allow scientists to find possible habitable planets around other stars and determine how earlier galaxies were formed. Hundreds of astronomers, engineers and technicians from around the world continue to design and manufacture telescope parts that when assembled will eventually become the Thirty Meter Telescope on Maunakea.